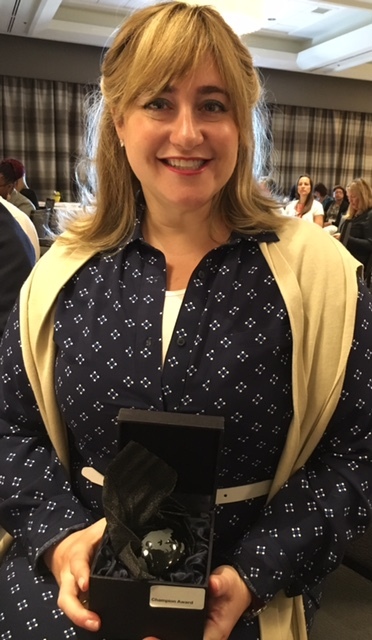 (PRLEAP.COM) May 5, 2016 - Little Rock, Arkansas – Batsheva Katz, Windsor Healthcare Communities Vice President, was named the 2016 Eden Champion today at the 8th International Eden Alternative Conference. The award recognizes "the efforts of an individual who champions the ongoing growth of the Eden Alternative Philosophy, bringing it to life for those closest to them and others around the world." Ms. Katz has been leading Windsor's efforts in adopting the Eden Alternative practices towards creating better skilled nursing care in all nine Windsor Healthcare Communities. A progressive approach to aging, the Eden Alternative stresses choice and fosters a person-directed approach to care, tailoring daily life and activities to individual needs and preferences under the guidance of interdisciplinary teams. "This award is not just a recognition of my work in promoting Eden for a number of years, but of the successful adoption of many of the Eden principles by our thousands of care partners," said Ms. Katz. "Eden Alternative homes are better for our elders, short term rehab guests, care partners (employees), and the families we interact with on a daily basis." Hyman Jacobs, CEO of Windsor Healthcare Communities, added "we have found that the substantial education, commitment, resources and action required to bring the Eden Alternative to life in a home is well worth the investment, considering the positive results it brings to our elders and our staff." Windsor Healthcare Communities provides clinically sophisticated post-hospital medical care and rehabilitation, as well as comprehensive skilled nursing care throughout New Jersey. A family owned and operated organization, Windsor is a recognized pioneer in promoting person-directed care that cherishes, honors and loves our Elders. We are committed to medical excellence and well-being for all that we serve.